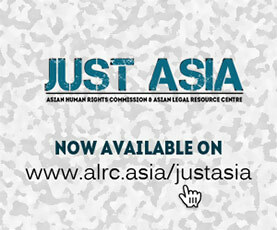 (Hong Kong, 31 May 2013) Ms. Neena Ningombam, representing the Extrajudicial Execution Victim Families Association, Manipur (EEVFAM) and the Asian Legal Resource Centre (ALRC) spoke at the 23rd Session of the UN Human Rights Council in Geneva. Neena spoke about extrajudicial executions in India and South Asia in the context of the report filed by the United Nations Special Rapporteur on extrajudicial, summary or arbitrary executions to the Council. The speech could be viewed here – kindly scroll down to Chapter 16, in the window next to the video. I am making this statement on behalf of the Asian Legal Resource Centre (ALRC) Hong Kong, and the Extrajudicial Execution Victim Families Association, Manipur (EEVFAM), India. The Constitution of India guarantees the right to life and fair trial of all citizens. Yet, today I am a widow, having lost my husband to the state agencies. After the murder of my husband, the government branded him a terrorist, and denied us of all state welfare schemes for widows. Refusing to admit this baseless charge, I fought an uphill legal battle, for four years, for my husband’s name to be cleared. Yet, today I stand along with thousands of widows, whose loved ones were extra-judicially executed, particularly in the North East and Kashmir of India, where, the Armed Forces Special Powers Act 1958 (AFSPA) is in operation. Following a petition filed at the Supreme Court of India, requesting the Court to probe into the 1528 cases of extrajudicial executions documented from Manipur, the Court appointed a high power commission that has revealed the systemic failure of the government to protect the Right to Life. Unfortunately, the commission’s report is not made available to the petitioners and the public. We sincerely hope that the Court will release the report, the contents that we are entitled to know as the petitioners in the case, in furtherance to the UN Principles on the Effective Prevention and Investigation of Extra-Legal, Arbitrary and Summary Executions. 1. Why has the report not touched upon the fact that the investigation of criminal cases in India is patently defective, primarily due to the inability of the crime investigating agencies to undertake credible and prompt investigations? 2. Was the Rapporteur informed by the government that the proper conduct of autopsies in cases of unlawful killings is impossible due to the lack of facilities in most government hospitals in the country? 3. What follow-up actions does the Rapporteur envisage with the Government of India, to ensure that his report to this Council is positively acted upon; failing which, many widows who are in the pursuit of justice will never receive it? 4. I am aware that similar conditions exist in other South Asian states, where victims of extrajudicial execution are systematically denied justice, and the governments in these countries refuse to admit that extrajudicial execution negates the fundamental premises of fair trial guarantees. Has the Rapporteur taken the initiative to address these states in South Asia?